Note: This is one of the industry specific measures that I follow. I only post this every few weeks or so. In year-over-year comparisons for the week, occupancy rose 4.1 percent to 66.8 percent, average daily rate increased 4.0 percent to US$107.24, and revenue per available room finished the week up 8.3 percent to US$71.65. Note: ADR: Average Daily Rate, RevPAR: Revenue per Available Room. The following graph shows the seasonal pattern for the hotel occupancy rate using a four week average for the occupancy rate. We are now headed into the fall business travel season. The 4-week average of the occupancy rate will increase again seasonally. For the month of September, the 4 week average of the hotel occupancy rate has been back to the pre-recession median level. Even though the occupancy rate has recovered, ADR and RevPAR are still about 3% lower than before the recession for the comparable week. 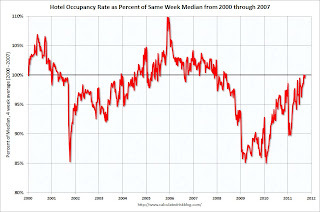 The second graph shows the 4-week average of the occupancy rate as a percent of the median since 2000. Note: Since this is a percent of the median, the number can be above 100%. This shows the decline in the occupancy rate during and following the 2001 recession. 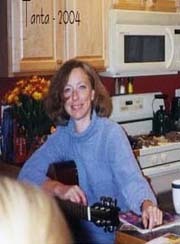 The sharp decline in 2001 was related to 9/11, and the sharp increase towards the end of 2005 was due to Hurricane Katrina. 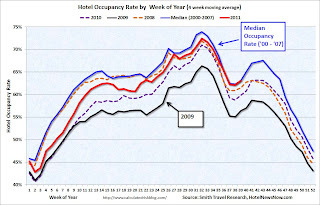 The occupancy rate really fell off a cliff in 2008, and has slowly recovered back to the median.